How do I delete a recipient? How do I add a recipient? 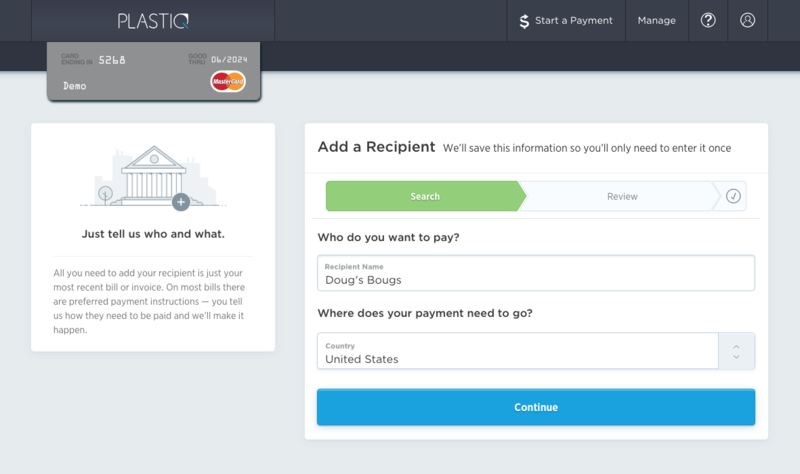 In order to make a payment, you first need to add a recipient, the business or organization you are paying. 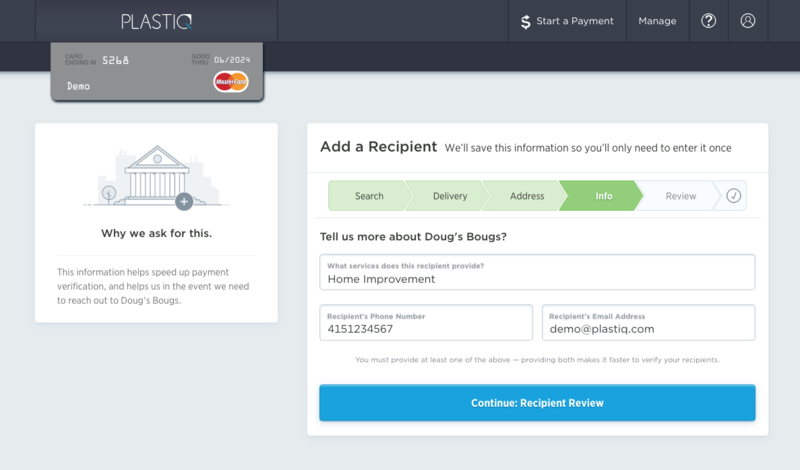 All you need to add your recipient is your most recent bill or invoice. On most bills there are preferred payment instructions — you tell us how they need to be paid and we’ll make it happen. This article details how to add a recipient funded by paper check, but ACH (bank transfer) and US Domestic Wire recipients may be added as well. To begin, click “Add New Recipient”. Enter the name of your recipient. This is the name that will appear on the "Payable to" line of the check. Choose the country where your payment needs to go. 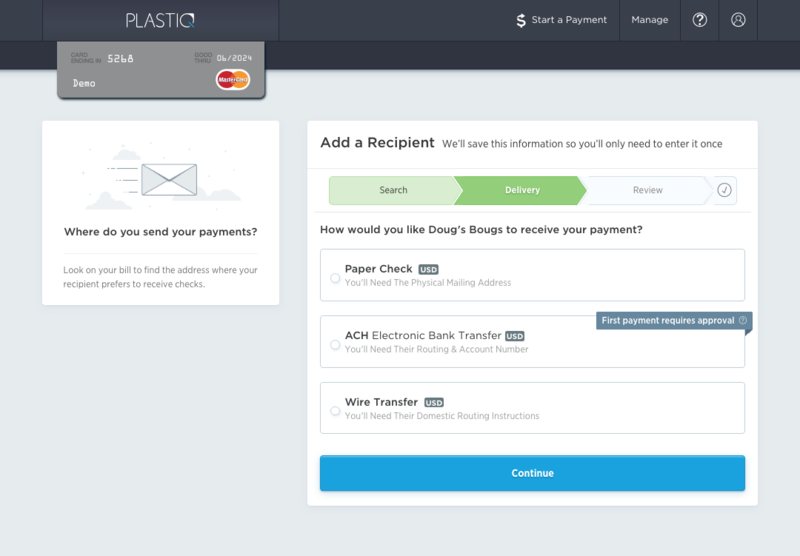 Currently, Plastiq delivers payments within the United States and Canada. Click “Continue”. If your recipient is already in our system, you may see some potential matches. As many companies have various locations, you may be asked to provide or verify the address listed. From here you will go on to Step 7 and add recipient info. If you do not see the business you are looking for, you can still add their information yourself by selecting “Paper Check”. Next, enter the address details of your recipient. Look on your bill or invoice to find the address where your recipient prefers to receive checks. Make sure to enter the address exactly as it should be delivered. This includes any apartment or suite numbers, correct postal or zip code, etc. 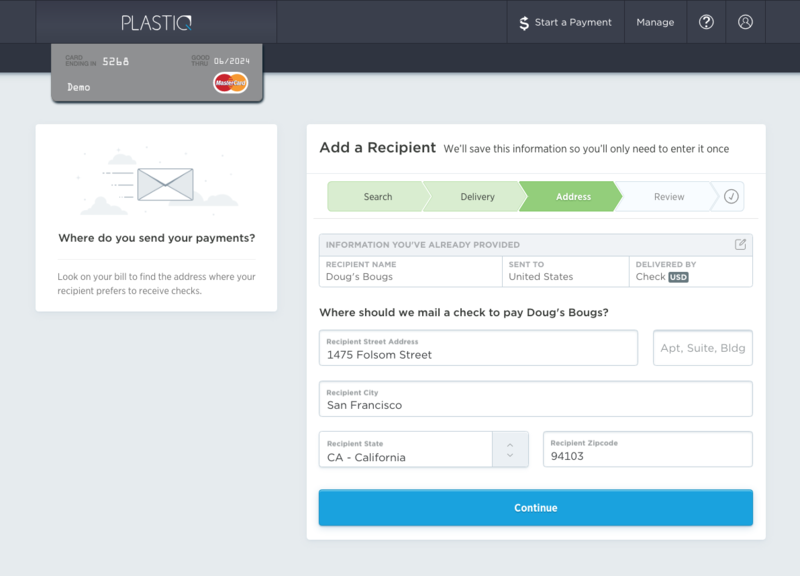 To ensure payment delivery, Plastiq may offer up a suggested address, which will be able for review. Please choose the best address for check delivery. 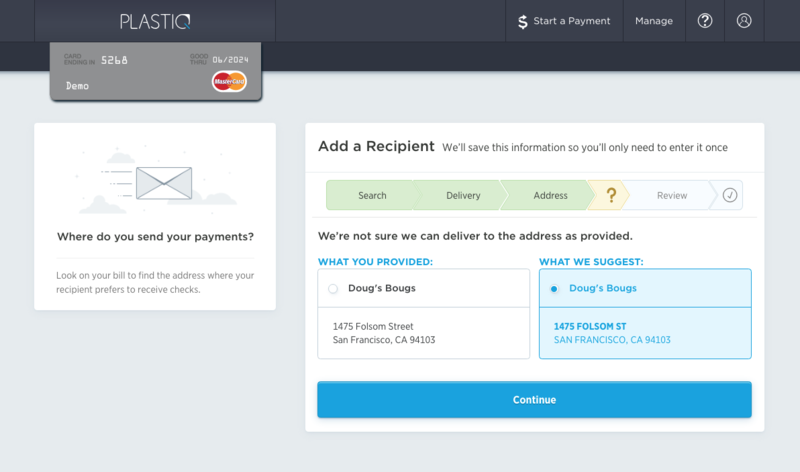 If you do not select our suggested address, the Payment Delivery Guarantee is waived. Once you select “Continue”, you will then be asked to provide details regarding the recipient, such as what goods or services they provide, the business's phone number and email. After all fields are complete, please review all recipient details and click “Save” to start making payments to this recipient. Why do you have to reach out to my recipient? What is Masterpass and how do I use it? What is the processing date?